I’m sitting in the midday sun on my deck, dogs at my feet, taking in the balmy spring air and listening to bird calls on what, technically, is the last day of winter. We are captivated by watching a group of birds noisily banish a red tailed hawk from their territory. After much flapping of wings and dueling from tree to tree, the hawk has retreated. Mourning doves call from the tumble down woods across the road. Spring breezes whoosh through the branches of tall pines. It’s a perfect day for quiet contemplation and reading the poetry of J P Reese. 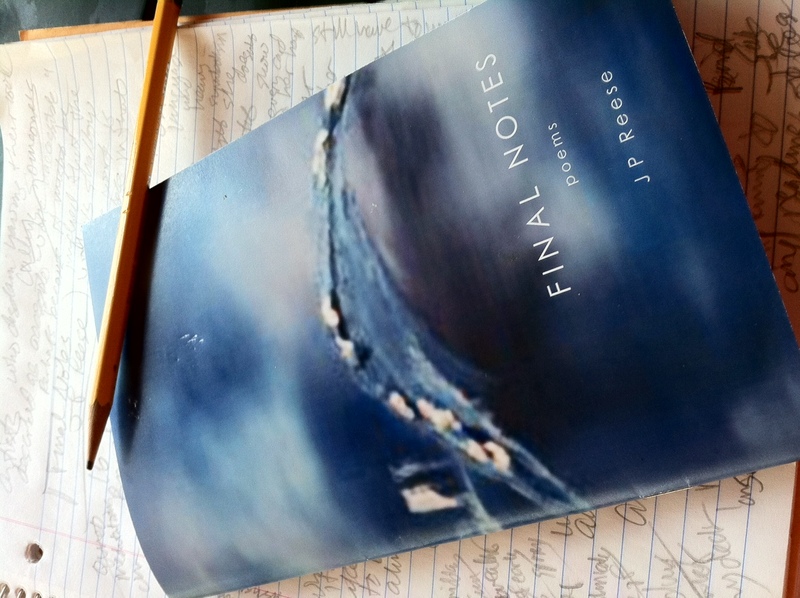 The book I have in my hand is Reese’s new chapbook entitled Final Notes. I’m not a literary critic nor do I aspire to be one. The Alice B. Toklas Book Journal doesn’t even have book reviews, as such. In fact, I prefer to call them Book Reports. I know it may sound juvenile, but I don’t care. It’s a way for me to share reflections about books I’ve read that have moved me in a positive way. I grew up listening to albums, first on vinyl, then tapes and CDs and now as digital downloads. No matter what the format, they’re still specific collections of songs, often thematically linked and arranged by the artist to be played in a specific order. I grew up with this structure and I have become hard wired to it. Perhaps I find the chap book format so appealing because it operates on so many of these same principles. For me, J P Reese’s chap book, Final Notes has that kind of album vibe. To carry that metaphor just a bit further, many of my favorite albums were a collection of 12-15 songs, each one only a little over two minutes long. Final Notes is a collection of 16 poems, each one of them short, compact, stripped down to bare essentials and almost Zen-like in its simplicity. However, this is not to say that economy of motion, brevity and simplicity are traits that are necessarily synonymous with shallow or superficial, because, in this case, nothing could be further from the truth. Reese’s poems are full of of the kind of heart and soul that is reached only by plumbing the depths and mysteries of the human spirit. Reese draws the reader into the theme of any given piece with clear language and vivid imagery, but the depth of meaning comes from reading the poems again and again. To return to my music metaphor, it’s the same way a song grows on me. I really need to hear it over and over again. Final Notes is a collection of poems about what it’s like to be alive in America in the 21st century. The poems are quiet meditations on the passage of time, relationships with domestic partners, love, loss, strength, and perseverance. Reese contemplates caring for aging parents “at the end of your life”, the shattering of the American dream against “the blind windows of Wall Street”, hopes and dreams for her children, a poignant profile of a psychically scarred soldier home from the war in Iraq which, for him, will never end, and a chilling, but beautiful refection on the day the Twin Towers fell that somehow reminds me of paper cranes of Hiroshima. For me, the shortest poem in the collection is the most cryptic, while at the same time, written in the most beautiful and lyrical language. Final Notes is a wonderful chap book of sparkling poems and I will return to it time and time again.